Tuesday was our first full day in Kuwait and it was full of incredible experiences. I am exhausted to the core after today, both emotionally and physically. We all met in the lobby at 0830 and jumped into a couple cars that took us to Camp Arifjan in Kuwait. We received a full debriefing about the country of Kuwait, including its history, its government past and present, its relationships with other neighboring countries and its relationship with the U.S. and our military footprint in Kuwait. Everyone in our group received a Certificate of Appreciation from the Area Support Group in Kuwait and we met with several officers before heading to lunch at the base and doing some much needed shopping. After lunch we departed Camp Arifjan and traveled to Kuwait Naval Base where we went out to sea with Col. Shock and members of the U.S. Coast Guard. The boats were so small that we had to split up and take two boats out together. John Baker, Chris Coghlan, Larry Beinfest and I opted for the faster of the two boats and tried to find out how fast we get it to go without dumping anyone out the side into extremely choppy waters. Amazingly, nobody went overboard but we were all drenched by the time we got back to the base. 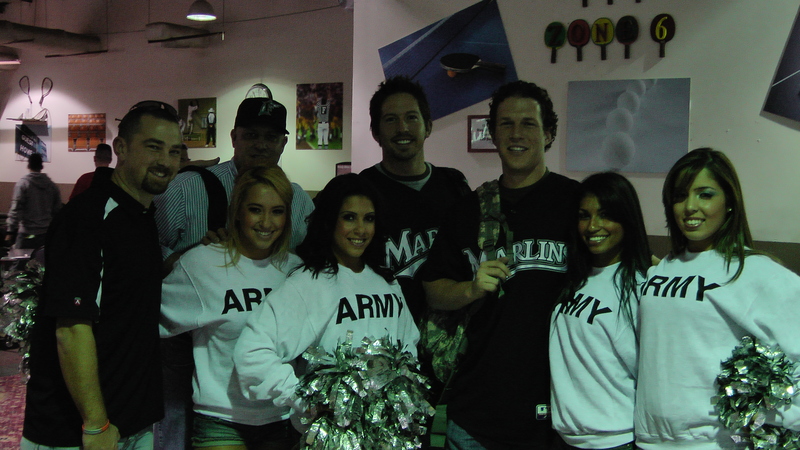 We all thoroughly enjoyed the experience and I would encourage everyone to check out the photos and videos at Marlins.com, they should be up sometime on Wednesday. After the ride, we were back to land and off to nearby Camp Patriot for a brief visit and Commaner’s Call, followed by a stage performance from the Mermaids and autograph session with the troops there. After a quick dinner at Camp Patriot we were off to the Kuwait Little League for an event that materialized at the last minute on our itinerary. We weren’t sure what to expect when we got there and we cerainly couldn’t have forseen the crowd of over 300 kids and parents waiting for our arrival! As we started to walk up the path between fields I started to notice a sea of teal as the vast majority of the kids were wearing Marlins shirts. As soon as the kids noticed us, they errupted with cheers and starting chanting “Let’s Go Fish!” I still have chills thinking about the reception we received and how excited the kids were to see the players and Mermaids. Meanwhile, Fredi Gonzalez’s plane had landed (you may remember that he was not able to get out of Atlanta and join us on our flight Sunday night so he was delayed 24 hours) and he met us at the park for the beginning of the Little League event. The kids had the opportunity to ask questions for Chris, John, Larry and Fredi for the first 20 minutes, and then they all came up individually to get autographs, take pictures and tell us how important baseball and the league has been to them. The Kuwait Little League has been in existence since just after the first Gulf War and it was a true inspiration to see these kids care so much about baseball and our visit to them. No matter how big of an impact we may have made on those kids there tonight, it was us who certainly left with memories that will last a lifetime. Our driver Gary, who I have really enjoyed getting to know over the first couple days, is an American who has worked in Kuwait for close to 20 years and he told us that he has never seen an event in all of these tours that touched him so much personally as our visit to the Kuwait Little League tonight. It was a wonderful way to conclude a long day. The group got together for dinner nearby and then called it a night. Another big day is on tap for tomorrow, including at least two base visits and a possible third before we pack our bags and get ready to head to our next destination. More updates from SWA soon..